Want to make a backup of your important data before or after partitioning your hard disk? Try our award-winning FREE backup software - AOMEI Backupper Standard. Completely free and easy-to-use software to backup & restore, sync and clone system, disk, partition and files for Windows PCs and laptops. Getting full editions gives you access to more powerful features! Please upgrade Standard Edition to advanced Edition and get $7 OFF. The "Lifetime Free Upgrades" license ensures that you're entitled to upgrade for FREE to any later new versions that we release after you buy. No annual billing or renewal cost. The license also includes free perpetual technical support. Note: If you uncheck this option, then it is the "Current Version" license, which is only 1-Time purchase without free major version (e.g. from 7.0 to 7.1 or higher) upgrade protection. In such case, you need to pay additional fee to upgrade the current version to each later version. Tips: For IT professionals, technicians, and consultants who would like to provide revenue-generating technical services to their clients, please choose AOMEI Partition Assistant Technician Edition. Onekey backs up and restores systems by making a factory recovery partition. Easy-to-use backup and recovery software to protect your system, partitions, and data for free. Free System Optimization Tool for a Cleaner, Faster and More Secured PC. Web-based app for managing files and transferring files across cloud drives for free. Free create a Windows PE bootable USB or CD/DVD for desktop and many useful tools. 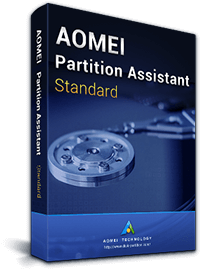 AOMEI Partition Assistant Professional Edition is an all-around application that integrates simple-to-handle options for disk and partition manage-ment. AOMEI Partition Assistant would seem to be the most powerful and capable disk partition utility we've tried. It's highly recommended for all users. AOMEI Partition Assistant is a top-flight partition utility and uniquely offers the ability to create Windows To Go disks from any flavor of Windows 8. I downloaded and installed your new version and used it to resize a small partition. I must say I was delighted in how good and efficient the software was. I will recommend it to all my computer savvy friends. First I want to say how much I appreciate your program. As a sys admin, partitions are always painful and you have made my life easier. I will try to get my company to go for the enterprise server edition. I just want to email to let you guys know that Partition Assistant Server saved my bacon. I will definitely use this product again it will always be highly recommended to my colleagues. All-in-one partition software & hard disk manager for 2 PCs. Complete and easy-to-use backup & restore software for 2 PCs. Both support lifetime free upgrades to every latest version. Powerful and seemingly magical hard disk partition management tool for 2 servers. Stable and robust data protection & disaster recovery solutions for a single server. One-time purchase, lifetime upgrade to every latest version.